Hubbell-Wiring Style Line® Autoguard™ Tamper-resistant GFCI duplex receptacle in ivory color, has patented shutter design with triple-wipe, nylon face and base construction for long-life durability. 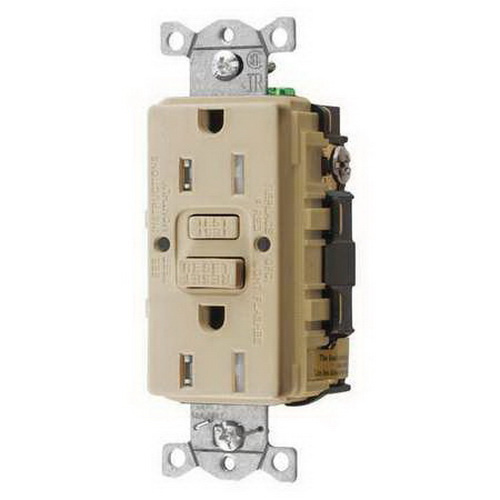 It 2-Pole, 3-Wire receptacle features zinc plated steel strap and brass contacts. It uses patented AUTOGUARD self-test technology for high performance. The commercial grade receptacle operates at a voltage rating of 125-Volts, current rating of 15-Amps, temperature rating of -35 to 66 deg C, short circuit rating of 10-Kilo-Amps and frequency rating of 60-Hz. It supports maximum load capacity of 1/2 HP. It comes with multiple drive screws. The GFCI duplex receptacle meets cULus, ADA, NEC® Requirements, CSA, NEMA® WD-6, NEC® 406.12 and NEC® 517-18© standards.